i'm still addicted to the podgeables...so much fun to paint the backside, then it's all sealed up when you flip it over to glue to a card. i dabbed the bird with yellow alcohol ink, then used mod podge to adhere some purple vine paper, so from the front, it looks olive green. i used permapaque markers to scribble and color on one side of the heart - it was so cool how much more vibrant the colors looked through the front. i painted the scalloped circle with yellow and purple alcohol inks, added some mod podge, then sprinkled an iridescent glitter. it really shimmers! just a few of us this month in my online swap...ohio, florida, pennsylvania, california, and england are representin' in the photo at the bottom. the theme was metal - for my card, i painted fabric for the background, fused it to stiff interfacing, and rimmed the edges with silver metallic marker. i adhered some cute embossed metal pieces that i received from another artist included with a previous swap. i love how little scraps come in so handy when making artist trading cards. the next atc swap for september will be a sewing theme...click here for details and join us! the gold and iron cards are from liz. the two love cards at top left are from sherry. the blue heart and red angel cards are from bambi. the purple textile card in the lower left is from nancy. tonight i was a guest on the creative cynchronicity live webcast—andrea currie and i talked about our experience on craft wars and we each did our own "re-do" of our pop craft from the show. click here to watch the replay! for our first challenge on craft wars, called the pop craft, we had to make a kid's treasure box in just one hour, and we had to incorporate little keys and locks. we built an 18" tall house from scratch, with a hinged roof covered in felt. it had kind of a woodland look, so we called it a gnome's home...the imaginary gnome would guard the kid's treasures inside. for the webcast tonight, andrea made a mini-version of our gnome's country home, so i decided to make our gnome his own little city house. it's 8" tall; each of the levels are thick paperboard boxes. i drilled holes in the corner of each so they could pivot open on long threaded rods in the corners, held in place with little washers and hex nuts. i still need to trim one of the rods a little shorter - you can see it peeking up at the top. in one corner, the rod goes through all three levels. in the other corner, a second rod goes through just the top two levels. i made the roof from corrugated paper and metal corner clips, and embellished with washi tape and gems. as of 5pm on 8/22, this contest is closed - check cathie's blog soon to see who won - thanks for entering! 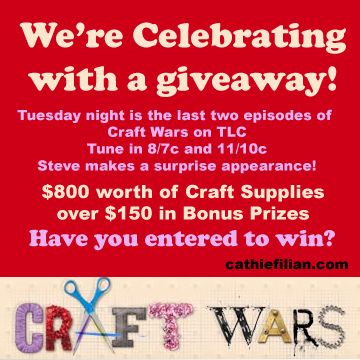 several of my fellow contestants and assistants are joining the craft wars producers, cathie and steve, to celebrate the last two episodes for the season, which both air on tuesday night, 8/20/11. what better way to celebrate than to give you, our loyal fans and viewers, a chance to win loads of supplies for your very own craft closet? it's going to be a two-fer tuesday...be sure to watch both shows! to enter to win, leave a comment right here on my blog...then for lots more chances to enter, visit cathie's blog first...she's got pics of all the prize loot that she has generously put together for you!! then visit all the rest of the craft wars vets below to enter by commenting on their craft wars giveaway posts too. last week, my friend liz showed our atc group how to drip and blend stamp inks with clear medium and smoosh it all between two layers of acetate (then peel apart) to get translucent effects. i added glitter to some while still wet, and substituted pearlex powder for the ink in others. it makes a gorgeous background for stamping on the un-inked side. i'm addicted to these little acrylic shapes! i had received this lovely image trio of a vintage lady printed on a fabric sheet as a gift from someone i swapped artist trading cards with. the images were perfect for adhering to the back of the podgeables with mod podge, and the woven texture of the fabric still shines through. for the smaller tiles, i inked the edges with a black permapaque marker and embellished the top with a little bling. they are just the right size for a pendant or an artist trading card. on the larger tag tile, i wrapped the edges with washi tape and added a little dimensional magic and glitter in the corners and on top of the rose. this card with the atc and pendant are for sale on my etsy. click here to see a sun catcher i made with podgeables - it's sparkly! this month's theme for my local atc club was to use fabric and paint. my cards above were made with scraps of painted fabric from various demos and swaps i've done. i fused and folded the fabric around a piece of stiff interfacing, added ribbon and charms, then highlighted areas with dimensional magic and just a whisper of glitter. these are the cards i received - the top left and center cards are from tarri to catch up with a couple older swaps (paint chip and whimsy themes). top right is from liz, and on the bottom from the left are atcs from cathy, tarri, and glenna. i really like these little plastic "podgeables" shapes - i used 4 together to make a sun-catcher. it's super easy to drill little holes in them for hanging. for the crown at the top, i dabbed it with a bright yellow-green alcohol ink to give it a marbleized effect. then i outlined the edges with dimensional magic and glitter. the sun shines through this bright piece beautifully! in the center, i used a blue alcohol ink to tint the flower shape and stamped it with a dotted circle pattern. i used mod podge to adhere some glittery leaf paper to the circle shape and glued it to the center. the flower is outlined with a gold leaf pen. i inked the key and then covered it with mod podge and dipped it into some blended blue and gold glitter and added a little bow to the top. i bent decorative headpins with beads to make all the little hooks and added some bling - it's nice and light and it looks really cute and sparkly hanging in my window! 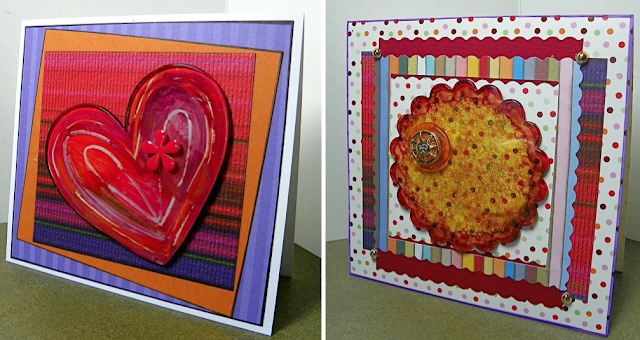 i've been having fun making greeting cards...this wonderful collection of buttons is from buttons galore & more. i love stacking them to make embellishments - lavender, olive, and ivory are gorgeous colors together. i cut the beautiful background papers from an old quilting arts calendar. these cards are for sale on my etsy.